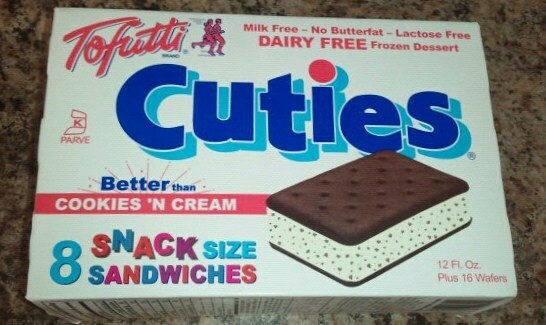 I’ve developed a serious liking for Tofutti Cuties Cookies n Cream, and wondered if there was a healthier alternative. I found the So Delicious brand coconut milk ones hanging out right next to these, and noticed that not only were they agave sweetened, but they were lower in fat and calories than their corn syrup sweetened sisters. The first thing I noticed out of the box was the wrappers. 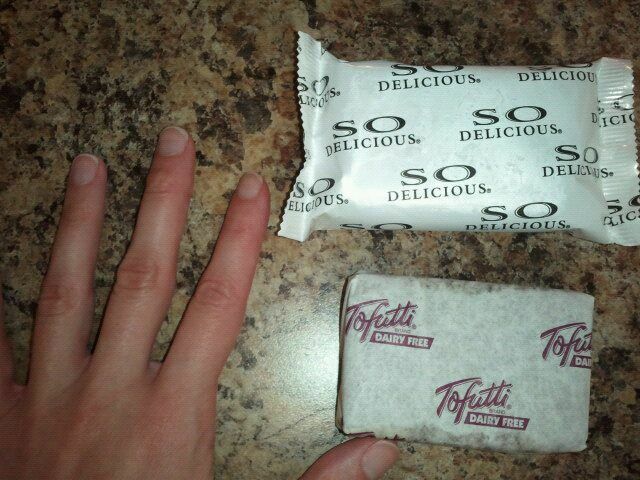 Tofutti uses the familiar paper wrapper of the classic that you have to carefully peel as you go, and admittedly will sometimes get really stuck on parts. SD uses plastic wrappers, which I wasn’t thrilled about, and are obviously not as biodegradable as paper, but don’t stick to the product and keep your hands clean. The SD one is also ever so slightly larger. As far as taste and texture go, I like the Tofutti ones better. Not tons better, just a teeny little bit. 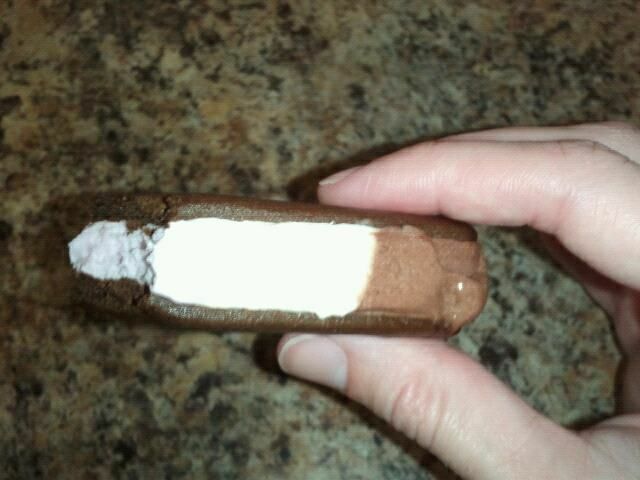 Maybe it’s the corn syrup, but the Tofutti version really is a perfect replica of the classic ice cream sandwich, both in the wafer and the filling. The SD is a little different in both aspects, with the wafer being a bit thicker and firmer, and the ice cream having the coconut milk undertone in the flavors, not necessarily a bad thing. The SD banana split flavors did contrast nicely with the chocolate. Good to know about the fudgesicles! I may consider getting them if I can stop buying the cuties, but it’s doubtful! Haha, I just bought the mint chocolate chip ones this afternoon! 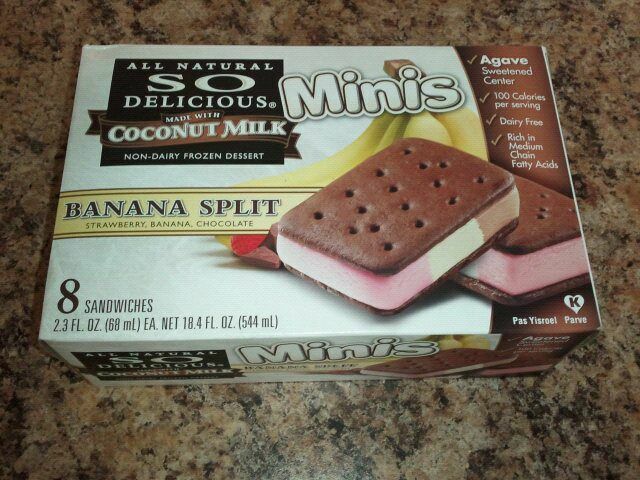 I like the So Delicious Minis made with soy. It doesn’t have the aftertaste. In general, I prefer the coconut milk ones. Like in a pint, the chocolate peanut butter swirl is amazing! : ) I will have to continue my research with the minis! Oh goodness, I didn’t even know Tofutti MAKES a cookies and creme! Thanks for spreading the awareness. 🙂 I like Tofutti sandwiches and So Delicious Purely Decadent cookies and creme ice cream in the pint. I wasn’t crazy about the c n c in the pint when I tried it a while back. I seem to prefer their coconut milk based ice creams. I’m a huge fan of So Delicious mini sandwiches. I love the subtle coconut taste, the fact that they don’t have corn syrup, and contain less fat, sugar, and calories than the Tofutti Cuties. I’ve never had a cookies and cream Tofutti Cutie, and that does sound delicious! I wonder if So Delicious would ever take their Cookies ‘n Cream ice cream flavor and put it in between two chocolate wafers. Now, that would be something! I agree entirely! Unfortunately after consulting the website, it appears that they do not at this time.